This week’s news that Salesforce founder Marc Benioff and his wife Lynne are purchasing “Time Magazine” reminded me that I had in fact been planning to write a blog post about ACL™ and Salesforce for some time. Many of you obviously know us for our work in connection with SAP® data analyses. But did you also know that ACL™ data analytics software can, for example, easily be used to analyse Salesforce data? We actually use this feature ourselves, as we use Salesforce to map large parts of our sales process (leads, opportunities, order process, approval workflows, delivery, contact data). While being powerful, helpful and absolutely essential, we do believe (sorry Salesforce!) that the tool lacks the ability to create flexible, attractive reports and to automate them and distribute them within a company. Yet the sales process is one very area where maximum possible transparency using data analytics is particularly important. There’s no need to fear the possible complexities of such a data analytics project. The first steps take only a few minutes, as ACL™ has thankfully already solved the main issue surrounding the analysis of Salesforce data – that of data access. However, neither the analysis itself nor the automation and visualisation of analyses are daunting tasks – they just need to be performed in the right sequence. Your user data are all you need. ACL™ offers pre-configured connectors, including one for Salesforce. The following screenshot shows the desktop version and how you can enter your Salesforce credentials to connect directly to the system in an instant. The second step shows you a list of tables on the left-hand side in which Salesforce stores your information. Most of these tables are self-explanatory, even if you don’t happen to be a database expert or IT specialist. For example, opportunities, contacts, etc. can be found in the appropriately named database tables. You can already map relationships (JOINS) between the tables. Or, if you want to implement this yourself in the data analytics software at a later date, you can simply extract the data table-by-table. Of course, the data volume depends heavily on your sales process. If you map small-scale end-customer business in Salesforce, you will have a larger volume of data. But if you only use it to support larger B2B deals, the volume of data records to be extracted will be tend to be smaller. Once data are available in the ACL™ analysis tool, endless analysis possibilities are open to you. For example, we use the software to analyse duplicates in master data (via the duplicate search function), to analyse historical data (average deal size, deals won per month, quarter and year over time; comparisons of previous years and trends), and to drive opportunities (opportunities with no movement for X days, per stage, etc.). 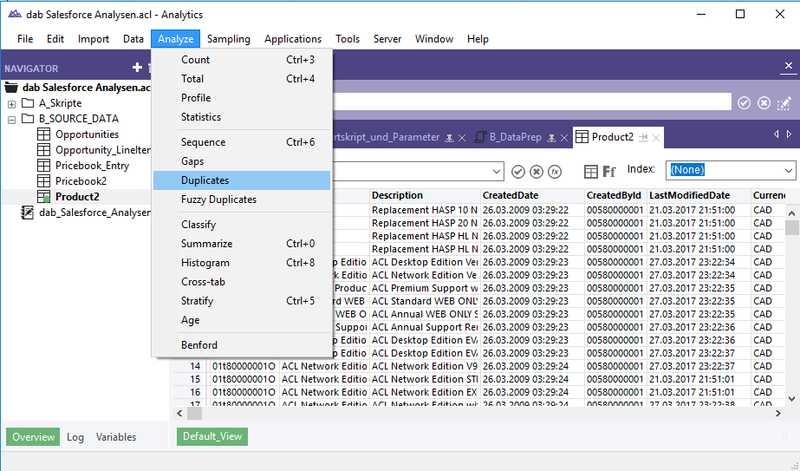 The following graphic shows how you can, for example, use the detailed data records in the extensive ACL™ AN desktop software to identify duplicates in data records, as selected in the screenshot. It thus offers endless opportunities to tech-minded users working with individual data records, while also enabling other employees to gain a quick overview of facts without going into minute details (although this option is still open to them as the visualisations can, if users so wish, also enable drilldown to the individual data records). If you haven’t yet had much contact with the analytics software ACL™, I should add that one of its major strengths lies in its own script language. This allows you to completely automate and continuously schedule both data access and also reports. In other words, analyses can be performed on a regular basis without any manual input. You can, for example, also use ACL™ GRC and the Results module to distribute data records to sales staff via workflows, or to share dashboards with the management in the form of storyboards. The following screenshot shows how easily trigger workflows and actions can be .... let’s say ... triggered. For example, you could conduct an automated check to identify transactions older than X days and then forward these to the relevant sales employee with a small questionnaire or information text. This is done using Condition->Action->Frequency. “Condition” (If something happens), “Action” (then do the following), “Frequency” (in real time or at certain points in time). We hope that you have enjoyed this brief look beyond SAP® and that it has given you food for thought about analysing additional data sources within your company. Please contact us at any time if you have questions on this article, about data analytics in general, or about products from dab and ACL™.